In late December 2002, the Musland family donated a conservation easement on their Camel Springs property in Douglas County to the Chelan-Douglas Land Trust. The conservation easement complements The Nature Conservancy’s work in Moses Coulee by protecting 560 acres situated around the headwaters of McCartney Creek, a pristine stream at the heart of the Moses Coulee Preserve. 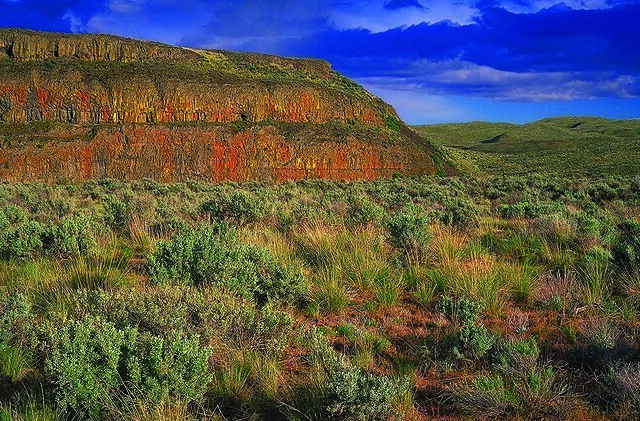 The Moses Coulee and Beezley Hills area contains one of the largest contiguous areas of shrub-steppe habitat remaining in the Washington state. The complex ecology and topographic diversity of the area creates habitats that support a wider variety of plants and animals than typical shrub-steppe environments. In addition to its connectivity with a vast area of protected, high quality shrub-steppe habitat, the Camel Springs property possesses many natural attributes including several natural seeps and springs with dense riparian vegetation along the creek bed of McCartney Creek; an area with a notable plant community dominated by black greasewood (Sarcobatus vermiculatus) and saltgrass shrubland (Distichlis spicata Shrubland). There are also many acres of high quality wildlife habitat in the form of shrub-steppe sagelands and steep cliffs and talus slopes that form the walls of Moses Coulee. Protection of the property’s riparian and stream complex will help to preserve one of the most pristine waterways in any of Washington State’s shrub-steppe areas. McCartney Creek, in an otherwise dry environment, is critical breeding and foraging habitat for many of the birds and animals that inhabit the landscape. This area contains the northernmost extent of the greasewood/saltgrass plant association in the United States. The Camel Springs Conservation Easement has an impressive variety of animals, rare plants, and bird species and provides critical connectivity with other protected habitat. This is a truly special place, and it provides refuge for many of our region’s species that rely on dwindling shrub steppe habitat that so defines our region.